After a winter of braising, roasting, boiling, and baking, we are eager for the low-maintenance vegetables of spring: tangles of pea shoots, slices of radish, leggy asparagus, peas popped directly from pod to mouth. When we do cook these tender little things, it doesn't take much -- and one of our favorite ways to do it is to blanch. 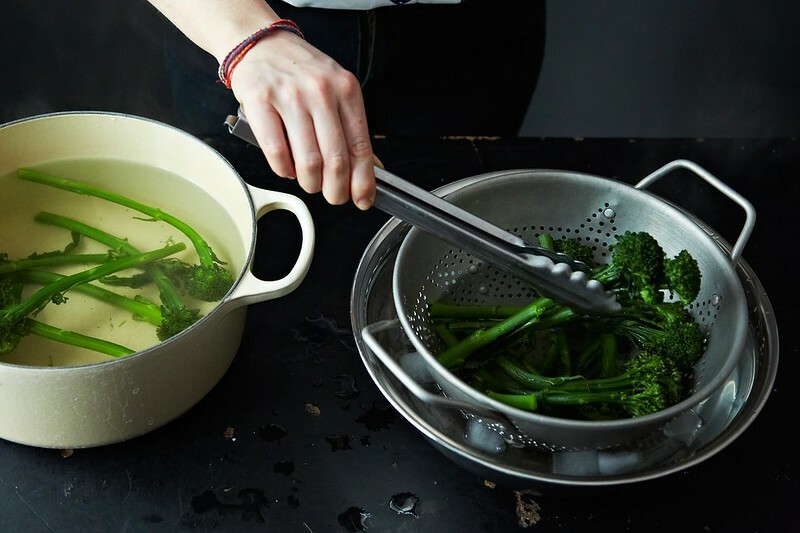 Blanching requires little more than putting a large pot of water on to boil, salting it to an oceanic extreme, and preparing your vegetables: trimming your beans, breaking down a head of broccoli. It serves three purposes: to partially cook vegetables, to season them evenly, and to retain their color -- the process both makes your asparagus a brighter shade of springy green, and keeps it greener for longer. Which vegetables should you blanch? It depends on what you're looking for. If you want to sauté thick, fibrous vegetables like collard greens, broccoli, broccoli rabe, or green beans, blanching them first will win you a shorter cooking time and tender -- but not mushy -- vegetables. If you've ever felt that you have to use too much oil to cook your vegetables to your desired softness, turn to blanching -- it will get you there faster, without excess oil. Bonus: If you want to grill hardier root vegetables -- like potatoes, sweet potatoes, or celeriac -- be sure to blanch them first. Fava beans want to be blanched. Blanched tomatoes shed their skins immediately. (Hussies.) You can blanch scallions to soften their bite. Almonds even need a bit of a blanch before they turn to milk. The process is a friend to almost any vegetable. First, fill your large pot with water, leaving enough room for your bubbles to bubble and your vegetables to fit without risking a tidal wave. 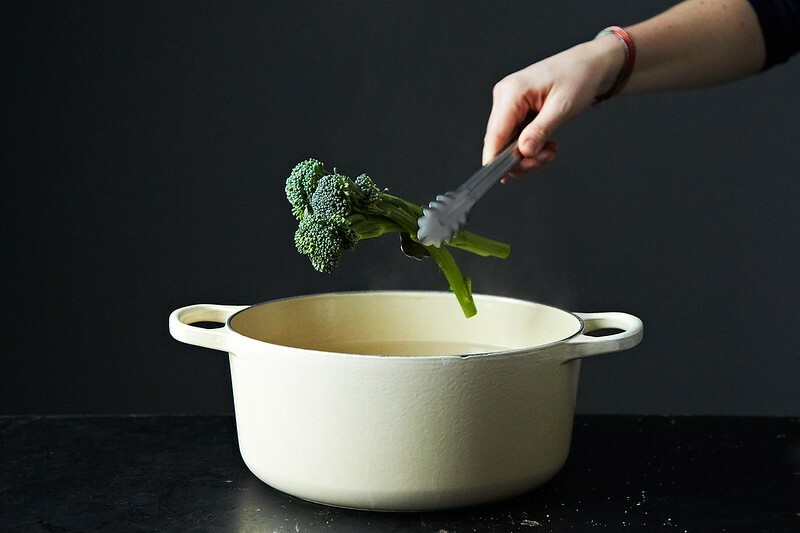 Thomas Keller suggests you use a stockpot big enough that the water continues to boil when the vegetables are added, but a large dutch oven will work, too. Salt the water like you would when cooking pasta -- it should taste like the sea. 1/4 cup of salt per gallon should suffice. Sit your colander inside your ice bath so that water fills the colander. Feel free to keep your pot uncovered -- Cooks Illustrated has ruled that vegetables blanched without a cover stay just as colorful and crisp as they do when covered. Once your vegetables are ready, remove them immediately from the pot and transfer them to the colander-in-ice-bath setup -- you want them to be completely submerged. Swish them around a bit, so that the icy cold water is evenly distributed and keeps them from cooking any more than you intended. This bit is often called "shocking." After your vegetables have cooled fully, dry them well. You can then store them in an airtight container in the refrigerator to have on hand for impromptu sautés, frittatas, and salads. They will make for an excellent last-minute addition to a packed lunch. Or toss them with a bright sauce, and be grateful that they don't need much else. This article was written by Marian Bull from Food52 and was legally licensed through the NewsCred publisher network. Please direct all licensing questions to legal@newscred.com. The blanching step in this recipe for Supreme Green Beans helps the beans keep their bright green color and crisp texture. Read on to learn more.